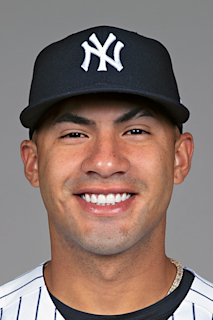 Full name is Gleyber David Torres Castro ("GLAY-burr")...Was honored in November 2018 with the Community Service Award by Hamilton-Madison House, a nonprofit organization dedicated to providing non-English speaking residents with the lessons English language, computer and career skills…spoke to event attendees about learning English after coming to the United States from Venezuela. Hit .271 (117-for-431) with 54R, 16 doubles, 24HR, 77RBI and 42BB in 123 games (104GS at 2B, 15 at SS)…ranked second among Major League rookies in RBI and fourth in HR…hit .538 (7-for-13) with 15RBI with the bases loaded...Ranked third in AL "Rookie of the Year" voting, collecting three second-place votes and 16 third-place votes…was a finalist for theSporting News AL "Rookie of the Year"...Of his 24HR, 13 came with runners on base…ranked third in the Majors with seven three-run HR…of his 24HR, 12 tied the game (2) or gave the Yankees the lead (10)…hit 13HR from the ninth spot in the lineup, the most by a Yankee in a single season from the No. 9 spot in franchise history...Is one of nine rookies in Yankees history to hit 20HR in a season and one of four in the last three seasons (also Gary Sánchez-20HR in 2016, Aaron Judge-52HR in 2017 and Miguel Andújar-27HR in 2018)...With teammate Miguel Andújar hitting 27HR, became the first pair of Yankees rookies to hit 20HR in the same season…according to Elias, are the eighth set of rookie teammates to both hit 20HR, the first since Cincinnati's Joey Votto and Jay Bruce in 2008…the Yankees are the sixth team in Major League history with multiple rookies with at least 20HR and 60RBI, joining the 2006 Marlins (Mike Jacobs, Dan Uggla, Josh Willingham), 1982 Twins (Gary Gaetti, Kent Hrbek), 1977 Athletics (Wayne Gross, Mitchell Page), 1975 Red Sox (Fred Lynn, Jim Rice) and 1960 Orioles (Jim Gentile, Ron Hansen)...His 24HR marked the second-highest single-season total by a Yankee in his age-21 season or younger, behind 21-year-old Joe DiMaggio (29HR in 1936)…owns the third-most career HRs by a Yankee prior to turning 22, trailing only Mickey Mantle (57) and DiMaggio (29)...Had 15HR during the first half, one of five Yankees rookies to hit at least 10HR before the All-Star break, joining Aaron Judge (30HR in 2017), Miguel Andújar (12HR in 2018), Joe DiMaggio (11HR in 1936) and Nick Johnson (11HR in 2002)-credit: Elias…joined Andújar as the first Yankees rookies with at least 10HR before the All-Star break in the same season (first team to do so since the 2016 Dodgers: Corey Seager-17, Trayce Thompson-13)...His 15HR before the All-Star Game were tied with Robinson Canó (15HR in 2011) for fourth-most by a Yankees second baseman entering the break, trailing only Canó (21HR in 2013, 20HR in 2012 and 16HR in 2010)...Was twice named AL "Player of the Week:" 5/21-27 and 8/27-9/2...Started at 2B in first 20 games after his recall, with the Yankees going 17-3…became the first position player in the Modern Era (since 1900) to start and be on the winning side in 16 of his first 17 Major League games...Is the second-youngest Yankee to record at least 17H in his first 15 career games (4/22-5/6), just two weeks older than Ben Chapman, who collected 17H from 4/19-5/4/30…is one of three 21-year-olds in Yankees history to record hits in 12 of his first 15 career games (Joe DiMaggio, Frankie Crosetti)…is the youngest Yankee to collect at least 11RBI through his first 15 games...Made his Major League debut on 4/22 at 21y, 130d old and was the ninth-youngest player to appear in a game in 2018 (Atlanta's Ozzie Albies, a "younger" 21 years old, Kolby Allard-20 years, Ronald Acuña-20 years, Mike Soroka-20 years, and Bryse Wilson-20 years, San Diego's Luis Urías-a "younger" 21 and Washington's Víctor Robles-a "younger" 21 and Juan Soto-19 years)…was the youngest position player to appear in a game for the Yankees since Melky Cabrera (age 20) in 2005...Made his Major League debut in 4/22 win vs. Toronto, going 0-for-4…was recalled from Triple-A Scranton/WB prior to the game…collected his first Major League hit in 4/23 win vs. Minnesota (single off Tyler Kinley)…at 21 years, 131 days old, was the youngest Yankee to record a hit since Melky Cabrera (20y, 338d) on 7/15/05 at Boston...Doubled in 4/25 win vs. Minnesota…at 21 years, 133 days old, became the youngest Yankee to record an extrabase hit since Derek Jeter doubled on 9/26/95 at Milwaukee at 21 years, 92 days old...Stole his first career base in 4/30 loss at Houston…at 21 years, 138 days, was the youngest Yankee to steal a base since Bobby Murcer on 9/23/66 vs. Boston (20 years, 126 days)…the loss marked his first time being on the losing side of a Major League game, snapping a career-opening eight-game winning streak…became the fourth position player in the Modern Era (since 1900) to start and be on the winning side in each of his first eight Major League games, joining Atlanta C Evan Gattis (won and started his first 10G in 2013), Washington-AL OF Babe Ganzel (first 9G in 1927) and Philadelphia SS Dave Bancroft (first 8G in 1915)…two pitchers also started team wins in their first 8G: St. Louis' Allen Watson (1993) and Chicago-AL's John Whitehead (1935)...Was named AL "Rookie of the Month" for May…in 24G, hit .325/.380/.663 (27-for-83) with 13R, 9HR and 24RBI, leading all Major League rookies in batting average, HR and RBI during the month (min. 75AB)…was the fifth Yankee (eighth time) to win AL "Rookie of the Month" and the third current Yankee to do so, joining Gary Sánchez (Aug. 2016) and Aaron Judge (four times in 2017)…teammate Miguel Andújar won in June and August 2018...Hit safely in nine straight games (5/2-11), the youngest Yankee to tally as long a hitting streak since Mickey Mantle had a 10G hitting streak from 6/24-7/3/52 (G1), ending at 20y, 257d...Had 3RBI, including a game-tying two-run ninth-inning single in 5/3 win at Houston…became the youngest Yankee (age 21y, 141d) with a game-tying or go-ahead hit in the ninth inning-or-later since Bobby Murcer (20y-134d) on 10/1/66 at Chicago-AL (RBI single in the ninth in a 5-3 win)…had 3RBI on 5/4, becoming the youngest Yankee (21y, 141d - 21y, 142d) ever with at least 3RBI in consecutive games (prev. Jerry Priddy, 21 years, 179 days, 5/6-7/41)...Hit three-run HR-the first of his Major League career-in 5/4 win vs. Cleveland…at age 21y, 142d, became the youngest Yankee to homer since John Ellis hit an inside-the-park HR on 5/17/69 vs. California (20y, 269d)…was the youngest Yankee to homer over the fence since Bobby Murcer (19y, 117d) on 9/14/65 at Washington-AL…became the youngest player born outside the U.S. to homer for the Yankees (prev. Jesús Montero, 21y, 281d on 9/5/11 vs. Baltimore)…was the youngest Yankees 2B ever to hit a HR (prev. Jerry Priddy, 21 years, 178 days on 5/6/41 vs. Detroit)…was the second Yankee since 1999 to hit a HR with at least two runners on for his first career homer (also Colin Curtis, three-run HR, on 7/21/10 vs. Los Angeles-AL; and Hideki Matsui, grand slam, on 4/8/03 vs. Minnesota)...Hit a three-run "walk-off" home run in the ninth inning to win 5/6 game vs. Cleveland, becoming the youngest player in franchise history (21 years, 144 days) to hit a "walk-off" HR (prev. Mickey Mantle, 21y, 185d on 4/23/53 vs. Boston)…according to Elias, is the third-youngest Yankee ever with a "walk-off" RBI, older than only Mark Koenig (age 21y, 76d on 10/3/1925 vs. Philadelphia) and Ben Chapman (age 21y, 121d on 4/25/1930 vs. Boston)…was the sixth Yankee with a "walk-off" HR within his first two career HRs, joining Clint Frazier (2017), Alfonso Soriano (1999), Mike Hegan (1967), Bob Grim (1957) and Frank LaPorte (1906)...Became the youngest player in AL history ever to homered in four straight games (5/21-25)…at 21 years and 163 days old, was the fourth-youngest player in the Modern Era (since 1900) to homer in four consecutive games (Miguel Cabrera in 2004 at 20y, 362d; Andruw Jones in 1998 at 21y, 138d; Albert Pujols in 2001 at 21y 147d)-credit: Elias…Ronald Acuña joined the group later in 2018 (5 straight at age 20y, 239d)…was the second Yankees rookie to accomplish the feat (also Gary Sánchez, 4G from 9/17-21/16)…his four-game HR streak was tied for the longest by a second baseman in franchise history (also Joe Gordon from 7/24-27/40 and Tony Lazzeri from 5/21-24/36)...Collected his first career multi-HR game in 5/21 win at Texas, hitting a two-run HR and solo HR…at 21y, 159d old, became the second-youngest player in Yankees history with a multi-HR game (Mickey Mantle hit 2HR on 8/11/52 vs. Boston at 20y, 296d)…both HR came off RHP Bartolo Colon (44.362), who is 23y, 203d older than Torres…according to STATS, marks the third-largest age difference between an older pitcher and younger batter on a HR in Yankees history, behind a Mickey Mantle HR off Satchel Paige (25y, 105d difference) in 1951 and Bobby Murcer HR off Hoyt Wilhelm (23y, 298d difference) in 1969...Collected his second career "walk-off" hit with a 10th-inning RBI single on 5/29 vs. Houston at age 21y, 167d (also a three-run "walk-off" HR on 5/6 vs. Cleveland, age 21y, 144d)…is the youngest player in franchise history with two "walk-off" RBI in the same season…was his first career extra-inning hit...Made his first Major League start (and app.) at SS in 6/4 Game 2 loss at Detroit...Homered at age 21 years, 182 days on 6/13 vs. Washington, in the same game as Nationals OF Juan Soto (19y, 231d)…according to STATS, their combined age of 41y, 48d was the youngest by opposing players to homer in the same game since Indianapolis' Egyptian Healy and the New York GIants' Mike Tiernan on 5/19/1887...Reached 50 career games on 6/19 vs. Seattle…through his 50th game, had 14HR and 35RBI…his 14HR were tied for seventh-most in AL history through a player's first 50 career games…were tied with Aaron Judge for thirdmost by a Yankee through 50G (Gary Sánchez-19 and Kevin Maas-15)…his 35RBI were eighth-most by a Yankee through his first 50 career games...Hit cleanup for the first time in his career on 6/30…at 21 years, 199 days, became the third-youngest cleanup hitter in Yankees history, behind Mickey Mantle (27G from 1951-53, first on 9/29/51-G1 vs. Boston at 19.344) and Lou Gehrig (4G in 1923, first on 9/27/23 at Boston at 20.100)…was the youngest since Mantle hit cleanup on 5/5/53 at Cleveland at 21 years, 197 days...Was the first Yankee-and sixth Major Leaguer-ever to hit at least 15HR in his first 60 career games at age 21-or-younger, joining Cody Bellinger (24), Adam Dunn (17), Willie Mays (17), Albert Pujols (17) and Frank Robinson (16)…became the second rookie in Yankees history to hit 15HR before the All-Star break (Judge-30HR in 2017)…his 42RBI were eighth-most by a Yankee through his first 60 career games...Was placed on the 10-day disabled list from 7/4 (effective 7/5) - 7/25 with a right hip strain…was removed from 7/4 win vs. Atlanta in the fifth with the injury…played three rehab games with Single-A Tampa...Was named via the Player Ballot to his first career All-Star team (did not play due to injury)…became the fourth Yankee to be named to the AL All-Star team at age 21-or-younger, joining Joe DiMaggio (age 21 in 1936), Mickey Mantle (ages 20-21 from 1952-53) and Willie Randolph (age 21 in 1976)…was the 12th Yankees rookie selected to an AL All-Star team, joining starters Aaron Judge (2017), Hideki Matsui (2003) and Joe DiMaggio (1936) and reserves Dellin Betances (2014), Masahiro Tanaka (2014), Willie Randolph (1976), Tom Tresh (1962), Ryne Duren (1958), Bobby Richardson (1957), Spec Shea (1947) and Joe Page (1944)…was the fourth Yankee to make the All-Star team as a rookie since 2014 (Betances, Judge and Tanaka) after the team had just one rookie All-Star from 1977-2013 (Matsui in 2003)...Hit solo HR and three-run HR and set a career high with 4RBI in 8/1 loss vs. Baltimore…was his second career 2HR game (also 5/21 at Texas)…became the second player in Yankees history to record at least two multi-HR games before turning 22 years old, joining Joe DiMaggio, who had three in 1936…at 21 years, 231 days old, was the youngest Yankee ever to record a second career multi-HR game, 10 days younger than DiMaggio was on 7/23/36 at St. Louis-AL (21 years, 241 days)...Collected his 50th career RBI with a sacrifice fly on 8/5 at Boston…reached the mark in his 74th game, the seventh-fastest Yankee to 50RBI, behind Joe DiMaggio (46th game), Joe Gordon (53rd), Tony Lazzeri (57th), Bob Meusel (65th), Gary Sánchez (69th) and Mickey Mantle (73rd)...Reached 20HR in his 93rd game on 8/27 vs. Chicago-AL, at the age of 21y, 257d…in Major League history, only eight other players as young as Torres reached the milestone in as few games (Ronald Acuña Jr., Tony Conigliaro, Carlos Correa, Bob Horner, Albert Pujols, Frank Robinson, Giancarlo Stanton, Darryl Strawberry)…became the third Yankee ever to hit 20HR prior to turning 22 years old (Mickey Mantle-57, Joe DiMaggio-29)…had a stolen base in the game, becoming the fourth-youngest Yankee to record both a HR and SB in the same game, behind Mickey Mantle (multiple times, youngest at 19y, 208d), Ben Chapman (21y, 133d) and Joe DiMaggio (21y, 177d)...Had a career-long streak of four straight games with multiple RBI from 8/30-9/2 (2RBI in each game)…collected the game-winning RBI in consecutive games (two-run HR in the fifth on 9/1, two-run single in the eighth on 8/31)...Hit two-run HR and was 1-for-4 in 9/7 win at Seattle…the homer was his 100th career hit and at 21 years, 268 days of age, became the fourth-youngest Yankees player to reach the milestone behind Mickey Mantle (20 years, 193 days), Ben Chapman (21 years, 207 days) and Joe DiMaggio (21 years, 230 days)...Hit a two-run home run off Eduardo Rodriguez in the fourth inning of 9/29 win at Boston…was the 265th by a Yankee in 2018, surpassing the 1997 Mariners (264) for most by any team in Major League history…was also the 20th HR by a Yankee from the ninth spot in the batting order, making the Yankees the first team in Baseball history with at least 20HR from all nine spots in the lineup (credit: Elias)...Made his postseason debut, batting .250 (4-for-16) with 1R in five playoff games...At age 21y, 294d, on the day of the AL Wild Card Game, became just the third Yankee since 1958 to appear in a postseason game at age 21-or-younger (also Jesús Montero at age 21y, 310d in ALDS Game 4 on 10/4/11 and Phil Hughes at age 21y, 102d in ALDS Game 1 on 10/4/07)…was the youngest position player to appear in a postseason game for the Yankees since INF Tom Carroll (age 19y, 15d) in World Series Game 5 on 10/2/55...Collected his first playoff hit in ALDS Game 1 at Boston, becoming the second-youngest player in Yankees history (21 years, 296 days) to record a postseason hit, behind Mickey Mantle (first postseason hit at 19 years old in 1951 World Series Game 2 vs. the New York Giants)…hit safely in all four games of the ALDS, the second-longest hitting streak by a Yankee, age-21 or younger, behind Mickey Mantle (6G: 4G in 1952 at age-20, 2G in 1953 at age 21)...Batted .347 (17-for-49) with 6R, 3 doubles, 1 triple, 1HR and 11RBI in 14 games with the RailRiders, appearing at 2B, SS and 3B…was named International League "Player of the Week" for 4/5-15 after hitting .385/.405/.564 (15-for-39) with 5R, 2 doubles, 1 triple, 1HR, 10RBI, 2BB and 1SB in 10 games. Played in 55 games between Double-A Trenton and Triple-A Scranton/Wilkes-Barre before missing the remainder of the season with a torn ulnar collateral ligament in his left elbow…combined to hit .287/.383/.480 (58-for-202) with 31R, 14 doubles, 2 triples, 7HR, 34RBI, 30BB and 7SB…recorded a .973 ﬁelding percentage (5E/187TC) while playing in 28G at SS, 15G at 3B and 10G at 2B... Began the year with Trenton-his ﬁrst action above A-ball-and hit .273/.367/.496 (33-for-121) with 22R, 10 doubles, 1 triple, 5HR, 18RBI, 17BB and 5SB in 32 games…reached safely in 27-of-32 games with the Thunder…at 20 years and 4 months, was the youngest player to make a 2017 Opening Day roster in the Eastern League... Was placed on the minor league D.L. from 4/19 (retroactive to 4/18) to 4/28 with mild right rotator cuﬀ tendinitis... Homered in 4-of-5 games from 5/14 (G2) through 5/19... Was promoted to Scranton/WB on 5/22 and hit .309/.406/.457 (25-for-81) with 9R, 4 doubles, 1 triple, 2HR, 16RBI and 13BB in 23 games…reached safely in 21-of-23 games with the RailRiders... Hit .400 (18-for-45) over his ﬁnal 12 games of the season (6/5-17)... Suﬀered a torn UCL in his left (non-throwing) elbow on a slide at home plate in a 6-2 win in Game 1 of a doubleheader on 6/17 at Buﬀalo…underwent "Tommy John" surgery on 6/21... Attended his ﬁrst Major League spring training as a non-roster invitee, hitting .448/.469/.931 (13-for-29) with 8R, 6 doubles, 1 triple, 2HR and 9RBI in 19 games…was named the recipient of the 2017 James P. Dawson Award, given annually to the outstanding Yankees rookie in spring training... Following the season, was tabbed by Baseball America as the Yankees' top prospect for the second consecutive season and the No. 6 overall prospect in baseball…Baseball America also labeled him as the Yankees' "Best Defensive Inﬁelder" and as having the "Best Inﬁeld Arm." Combined with Single-A South Bend and Single-A Myrtle Beach to bat .287 (140-for-487) with 54R, 24 doubles, 5 triples, 3HR, 64RBI and 22SB in 126G…was ﬁfth among all Cubs farmhands in batting average and stolen bases... Spent the majority of the season with South Bend, hitting .293 (136-for-464) with 53R, 24 doubles, 5 triples, 3HR, 62RBI and 22SB in 119 games…ranked ninth in the Midwest League in BA…was named to the Midwest League Mid-Season and Postseason All-Star teams and was tabbed the Midwest League Prospect of the Year... Was transferred to Myrtle Beach on 9/2 and hit .174 (4-for-23) with 1R and 2RBI in seven games... Following the season, was named the top prospect in the Cubs organization by Baseball America, as well as the No. 41 overall prospect in baseball. In his professional debut, combined to bat .297 (54-for-182) with 37R, 8 doubles, 6 triples, 2HR, 33RBI, 29BB and 10SB in 50 games with the AZL Cubs and short-season Single-A Boise…his .297 BA was the third-highest among all Cubs minor leaguers... Began the season with the AZL Cubs and hit .279 (43-for-154) with 33R, 6 doubles, 3 triples, 1HR, 29RBI, 25BB and 8SB in 43 games…batted .353/.432/.485 (24-for-68) with 18R, 5 doubles, 2 triples and 18RBI in his ﬁnal 20 games with the AZL Cubs... Was promoted to Boise on 8/25 and reached safely in all seven games, hitting .393/.469/.786 (11-for-28) with 4R, 2 doubles, 3 triples, 1HR and 4RBI... Following the season, was tabbed by Baseball America as the No. 8 prospect in the Cubs organization. Was signed by the Cubs as a non-drafted free agent on 7/2/13…was ranked by Baseball America as the No. 2 prospect in the 2013 international free agent class. July 25, 2018 New York Yankees activated 2B Gleyber Torres from the 10-day injured list. July 21, 2018 New York Yankees sent 2B Gleyber Torres on a rehab assignment to Tampa Tarpons. July 21, 2018 sent 2B Gleyber Torres on a rehab assignment to Tampa Tarpons. July 5, 2018 New York Yankees placed 2B Gleyber Torres on the 10-day disabled list. Right hip strain. April 22, 2018 New York Yankees recalled 2B Gleyber Torres from Scranton/Wilkes-Barre RailRiders. March 14, 2018 New York Yankees optioned SS Gleyber Torres to Scranton/Wilkes-Barre RailRiders. November 20, 2017 New York Yankees selected the contract of Gleyber Torres from Scranton/Wilkes-Barre RailRiders. September 18, 2017 Scranton/Wilkes-Barre RailRiders activated SS Gleyber Torres from the 7-day disabled list. June 18, 2017 Scranton/Wilkes-Barre RailRiders placed SS Gleyber Torres on the 7-day disabled list. May 22, 2017 SS Gleyber Torres assigned to Scranton/Wilkes-Barre RailRiders from Trenton Thunder. April 27, 2017 Trenton Thunder activated SS Gleyber Torres from the 7-day disabled list. April 19, 2017 Trenton Thunder placed SS Gleyber Torres on the 7-day disabled list. April 3, 2017 SS Gleyber Torres assigned to Trenton Thunder from Tampa Yankees. January 31, 2017 New York Yankees invited non-roster SS Gleyber Torres to spring training. July 25, 2016 SS Gleyber Torres assigned to Tampa Yankees. March 22, 2016 SS Gleyber Torres assigned to Chicago Cubs. March 3, 2016 SS Gleyber Torres assigned to Chicago Cubs. September 2, 2015 SS Gleyber Torres assigned to Myrtle Beach Pelicans from South Bend Cubs. April 6, 2015 SS Gleyber Torres assigned to South Bend Cubs from Eugene Emeralds. March 9, 2015 SS Gleyber Torres assigned to Chicago Cubs. August 24, 2014 Gleyber Torres assigned to Boise Hawks from AZL Cubs. June 21, 2014 SS Gleyber Torres assigned to AZL Cubs. February 21, 2014 SS Gleyber Torres assigned to VSL Cubs. July 2, 2013 Chicago Cubs signed free agent SS Gleyber Torres to a minor league contract.